The Jordan Brand is looking to boost their sales in the market this year and besides releasing fusion shoes, they are also trying to make some noise by releasing retro versions of the famous Jordan Brand shoes. 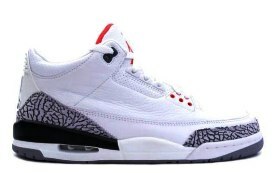 And today, the first edition of the Air Jordan III Retro this year is set to hit the shelves and with the features and durability of its predecessors, it is expected to attract a lot of sneaker lovers again! Although more colourways are schedule for release this year, the classic White/Fire Red-Cement Grey-Black should not be missed because it is one of the best colourways for this year! So what are you waiting for, get one now and you’ll never regret it!